I am so happy that fall has arrived with the cooler weather! I am ready for the beautiful leaves and pumpkins. The boys are ready for Halloween costumes and candy. I don't know if it's the cooler weather or the promise of candy, but fall can bring an air of hyperactivity among little learners. A great way to keep the momentum going in your learning environment is to use the fun of the season to explore concepts you want to teach. A pumpkin unit can be a fun preschool themes. 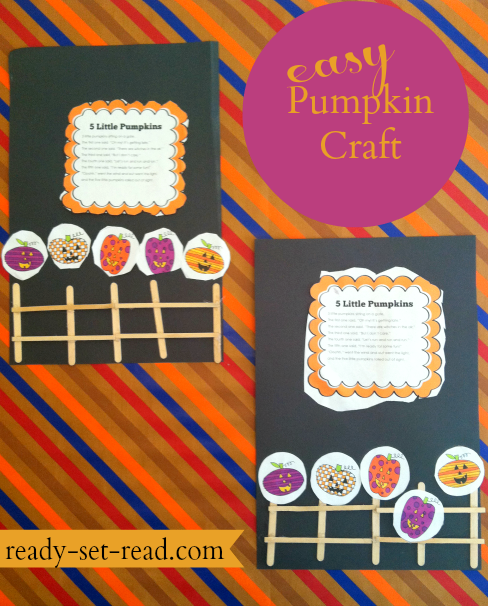 I've been working with a pumpkin theme with my preschooler and my kindergarten child. We've been learning Halloween songs about pumpkins, building Halloween vocabulary, using pumpkins to explore number concepts and science concepts. We've been reading wonderful fiction and information text about pumpkins, and enjoying pumpkin crafts. I haven't forgotten about the boys' request for candy either, it turns out mellowcreme pumpkins are the perfect math manipulative for a pumpkin unit! Over the next few days I'll be sharing some fun pumpkin activities. Today I want to showcase a Halloween song that works well with a pumpkin unit. The activities I am sharing today would also be great for word work. If you've visited Ready-set-read.com before, you know that every Wednesday is Word Work Wednesday. Of course, I have to sneak a little word learning into my post today!! This post contains affiliate links. 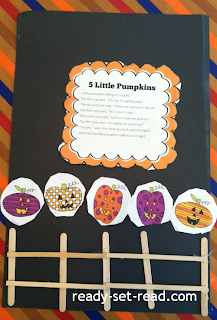 A favorite poem/ song to use with a pumpkin unit is 5 Little Pumpkins. There are a few versions of this poem found in books. This is a song/ finger play that I learned as a child, though, so I used my version, courtesy of Athena Elementary music teacher Mrs. Verges. The first one said, "Oh my! It's getting late." The fifth one said, "I'm ready for some fun." 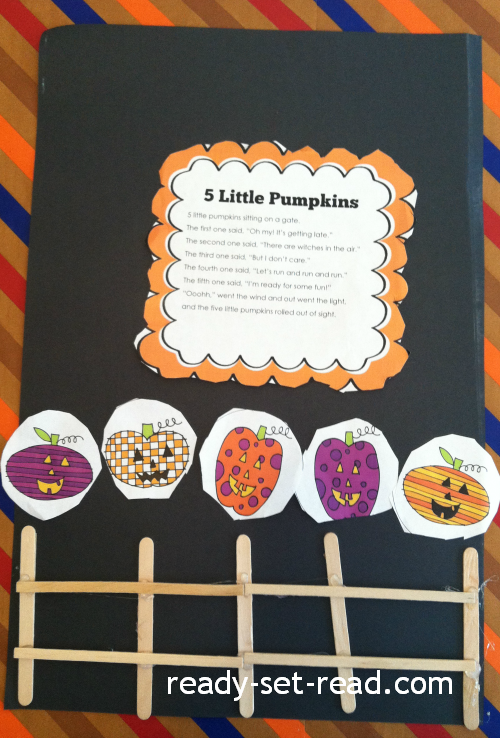 After reading the Five Little Pumpkins poem, we created a simple craft. I printed the lyrics to the poem. The boys cut it out and glued it to the top of a large piece of construction paper. Then we made a gate (fence) by gluing craft sticks to the bottom of the page. The boys added 5 pumpkins atop the gate. This makes for a great take-home project. You can get this ready made activity in my pumpkin unit. The common core state standards asks kindergarten students to identify rhyming words and give examples of them (RF.k.2.a) Poetry is a great opportunity for children to practice identifying rhyming words. Begin by reading the poem with the student and giving them the opportunity to fill in the rhyming words. Then ask students to to identify the rhyming words in the poem. Expand the learning by having students tell other words that rhyme with that group of words. The common core state standards asks kindergarten students to count syllables in words. (RF.K.2.b). A thematic poem is a fun way to practice syllables. Pull all of the fun Halloween words such as pumpkin, witches, etc. Have students clap the words and identify the number of syllables. If you need printable copies of the words with pictures for your white board or pocket chart, check out my pumpkin unit. 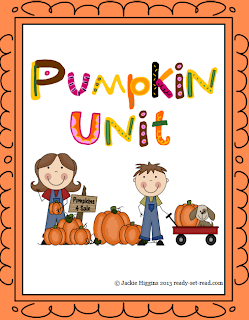 If you are looking for more activities for a pumpkin unit, I have a ready made unit in my Teachers pay Teachers store. You'll find literacy activities, math activities, science activities, and printable early reader books. 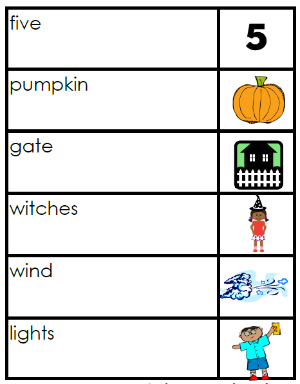 Printable Emergent Reader "10 Little Pumpkins" for students to read and practice tracing number formations. Do you have a favorite Halloween song at your house? Thank you, Jackie. I love all your tips for how to help kids with basic reading skills. We will definitely be using some of these at home this week. Thanks! I love that you focused on syllables. JDaniel is working on them at school. He will really like this activity. Logan is working on them at school too! Must be a common core objective for first quarter of kindergarten at our schools! Logan is having trouble with plurals. He says "pump-kin-s" and claims it has 3 syllables. Other than that, he has syllables down-- so I guess we'll keep practicing! I hope JDaniel enjoys it. Great ideas Jackie! I like the syllable counting activity too. The poem is so cute that it just begs for follow-up activities! Thank you for sharing on my Facebook page today too! These are great ideas--your pumpkins are so cute!! Thanks so much for sharing today!! You know, I just stumbled on my own 5 Little Pumpkins post in my archives - we loved this song when daughter was 3. Whatever we did with her certainly paid off with her language arts skills :) Thanks for sharing your unit with Afterschool!